Do you like to play robots ring wrestling revolution games? If yes then Gravity Games Studio presents you the best game of fighting robots which is Futuristic Robot Cage Fighting Games, where you can create your dream wrestler from multiple devastating moves and battle for custom championship belts. Robot wars have begun - the only way to stop it is to kill the robot gangster and save the world. Crazy box competition with fighting machines! Use all your Ninja, Taekwondo, Mauy Thai, Boxing and other fighter skills. You need to be a terror fighting ultra-man and professional killer to play this killer game. 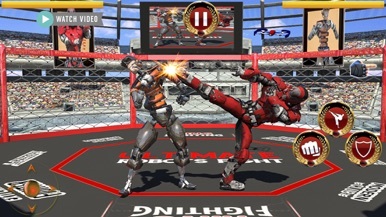 Fight the robot opponent and use various kicks and punches to gain the advantage. Do not also forget about blocks. Robot killer game with extreme fights and monster warriors. In this robot games new and free robot battle games you will face melodramatic robot games ring fight 3d. 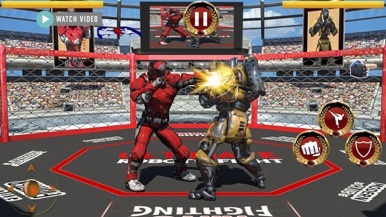 This brilliant robot boxing games will definitely give you the pro practice of best robot fighting games 3d. Be careful in robots wars while fighting in ring. 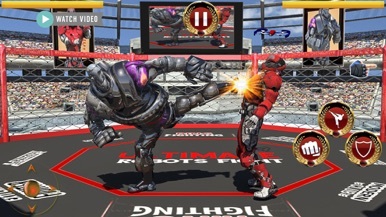 Are you ready to kill the iron robot in ring fighting battle? Destroy the ring, mat and even the referee! Upgrade your wrestler’s strength to increase the power of wrestling, fighting and knockout your opponent’s so that they never fight with you in this sports game. Play the toughest of real robot games steel fighting with best robot simulator ever. Are you expert enough to control a giant robot in this futuristic Cage robot battle 2018 Ring fighting games? If yes, then you are at the right track to get your daily adventure doze with this fantastic robot fighting games new and free robot boxing games! 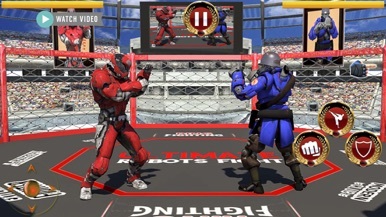 Control, Punch, Jab Punch, Super Punch, Super kick, Flip Kick and fight with all opponent robots carefully and defeat them badly in this real robot games ring fight 3d battle. •	Robot fight in the ring with death machines. •	Unleash your metal punches and steel kicks. •	Knock out the real robot by fighting in the ring. •	5 action pack levels of boxeo robot fight. •	Excellent indoor robot wrestling environment. •	Audience to boost your confidence in this robot ring game. •	Realistic robot fight and battle sounds effects. So, what are you waiting for? Let’s experience the thrilling robot fighting in this ring battle arena game and become a world superhero robot star in this monster city fighting game. Enjoy the thrill of boxing games and superheroes games with the extreme hero monster ring champion. Be a super ring robot fighter and create a world record of winning ring fights. Show off your fighting skills and become a mortal fighter and counter the enemy attack, but don’t allow them to strike back. Futuristic Robot Cage Fighting will be updated according to your suggestions. Don't forget to leave a review with your feedback. This app is used for experiments to check how long it has passed since receiving notifications by administration console. Connect to the Crossroads MN app. Connect and engage with Crossroads Church! You will be able to view upcoming events, give, read the bible, and more! At Crossroads, we love Jesus and others so much that our mission is simply to bring Jesus to people and people to Jesus.